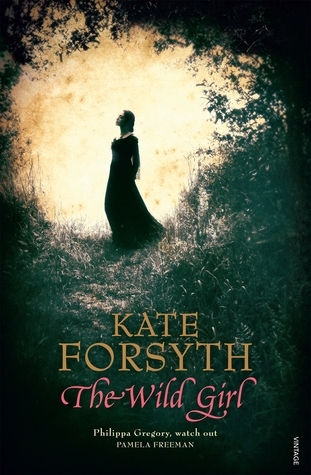 Though best known for her children’s books, Kate Forsyth has now written two adult novels in a row on fairy tale themes. Bitter Greens (on this year’s Aurealis and Ditmars lists, the Australian awards for speculative fiction) was about the young woman who wrote a version of the Rapunzel story back in the 17th century, intertwined with the Rapunzel tale itself. That one was historical fantasy, The Wild Girl is straight historical fiction centered around those collectors of tales, the Brothers Grimm, as seen by the girl next door, Dortchen Wild, who would eventually marry one of them and told them about a quarter of the stories in their collection. But the fairy tales are there anyway, again intertwined with the main story, though not in exactly the same way as in Bitter Greens. There are quotes from the stories Dortchen Wild told Wilhelm Grimm, carefully connected with whatever is happening in that part of the novel. Dortchen Wild, daughter of an apothecary and no mean herbalist herself, falls in love with Wilhelm Grimm when she is just 12 and he a few years older. He is the big brother of her best friend Lotte, kind and handsome and probably doesn’t know she exists, except as someone who knows many of the folk tales he and his brother Jakob are collecting. But the years go by. Napoleon invades. The small German country of Hesse become the kingdom of Westphalia, ruled by Napoleon’s extravagant and heedless younger brother, Jerome. The Grimms and Dortchen’s family have a lot more to worry about than a romance that might or might not happen. And Dortchen has been abused horribly by her father, one of the nastier characters I have come across in fiction recently. This is a wonderful piece of historical fiction. It is based on an idea expressed by Valerie Paradiz in Clever Maids: The Secret History Of The Grimm Fairy Tales, that the Grimm brothers got their stories, not from illiterate peasants and old grannies at the spinning wheel, but from middle class, educated young women of their acquaintance, starting with the girl next door. As with all good historical fiction, history has been interpreted. There will always be some things we don’t or can’t know. When that happens, the author has to pull together the facts we do know and come to a conclusion. Forsyth has been done that very well. The author has taken only a few minor bits of license, which she mentions in her afterword, but she has done it intelligently, researching the period and the people thoroughly and making it all believable. It’s strange, reading The Wild Girl, to imagine that all this was going on while the Regency was happening in England and Jane Austen was writing gentle, witty romances. I hadn’t realized that the first edition of the Grimm stories was a flop. Live and learn! Another thing: I always thought the Grimm stories were nastier and more violent than their counterparts in other countries, but this isn’t always the case. While reading The Wild Girl I was comparing Grimm stories with those of Perrault and others. “Sleeping Beauty” in Grimm ends with the princess and her prince wandering off happily into the sunset; the French Perrault story doesn’t and with the princess awakening. She has a monster for a mother-in-law: literally! One who tries to eat her and her children. “Aschenputtel” has some gruesome bits, but at least Grimm’s Cinderella isn’t a murderer like her Italian counterpart, Cenerentola, whom I discovered on the Sur La Lune Fairy Tales web site. The story of “Little Red Riding Hood” is nastier in the French version.